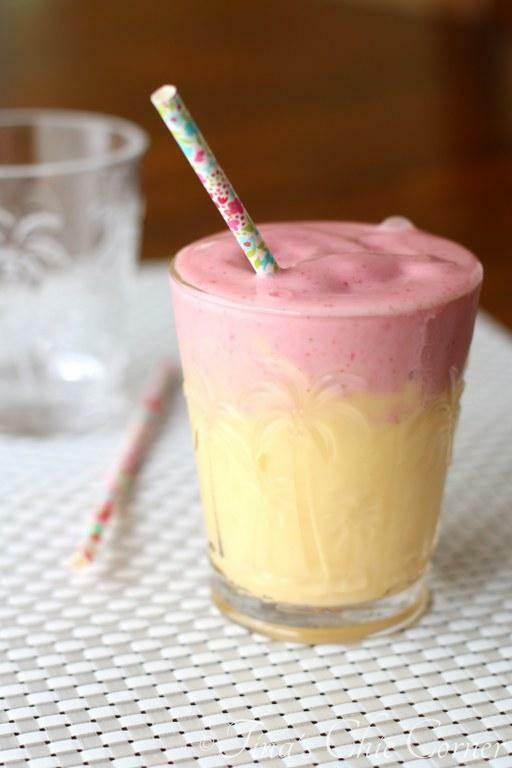 I hope you guys aren’t getting sick of smoothie recipes because I’ve got another fab one for you. How crazy cute are these glasses!?! I just bought them from the Home Goods store on Friday for $3.50 each. Of course I needed an excuse to use them right away and thought this fun smoothie was the perfect way. Get it? 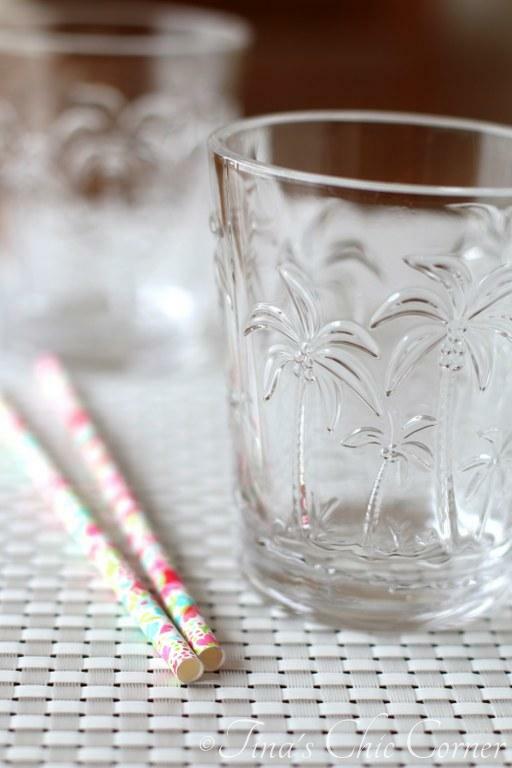 Tropical fruit in a smoothie, palm trees on an adorable cup? I like to keep an assortment of fruit stashed in the freezer so that I can whip up whatever suits my mood. Today it’s all about strawberries and mangoes, an awesome fruity combo. Strawberries and mangoes sitting in a tree… k-i-s-s-i-n-g. Sorry, that was the first thing I thought of when I was thinking of how to describe this combo. It’s awesome. Period. End of story. I’m totally loving the bright colors going on here. It’s super cheery and who couldn’t use that in the morning? In a blender, add all of the ingredients and blend them until they are smooth. Two Layer Version: First, blend 1/4 cup of the vanilla Greek yogurt, 1/2 cup ice and the chopped strawberries and pour it into a glass. Rinse out the blender. 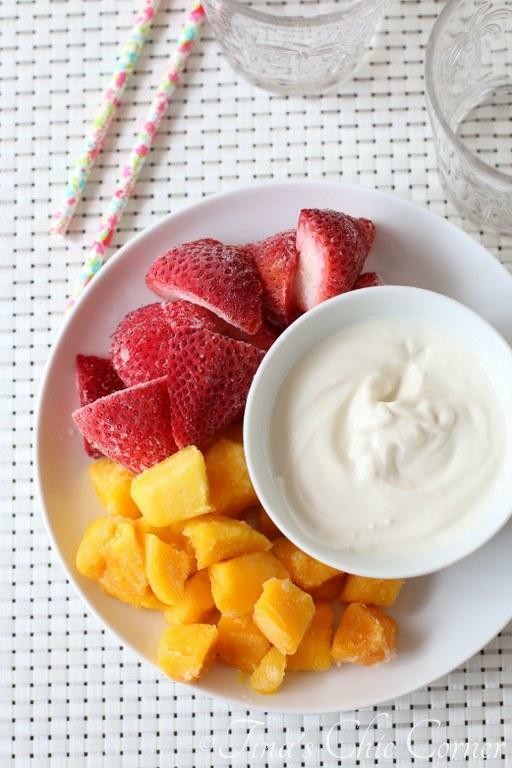 Next, blend the remaining 1/4 cup of vanilla Greek yogurt, 1/2 cup ice, and chopped mango. Finally, pour the mango layer gently into the glass. (Optional) Sprinkle some chia seeds on the top. (Optional) Sprinkle some granola on the top… but get a spoon ready! 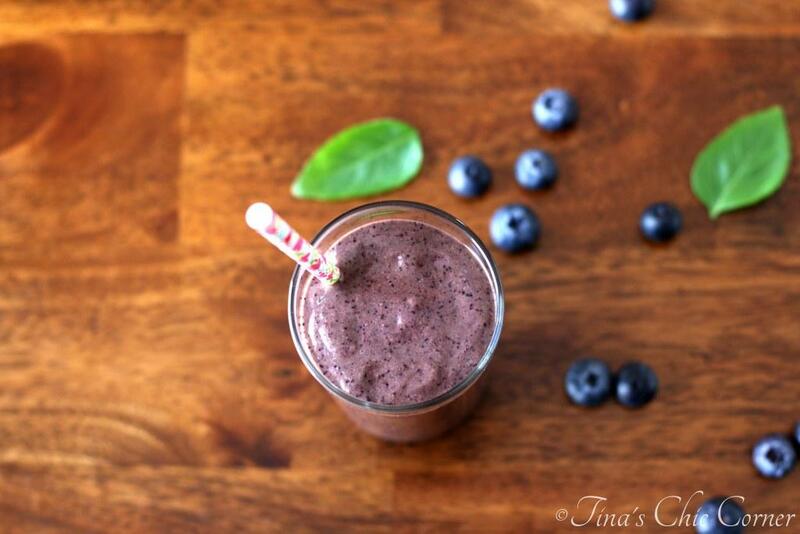 Interested in some other fab smoothies? 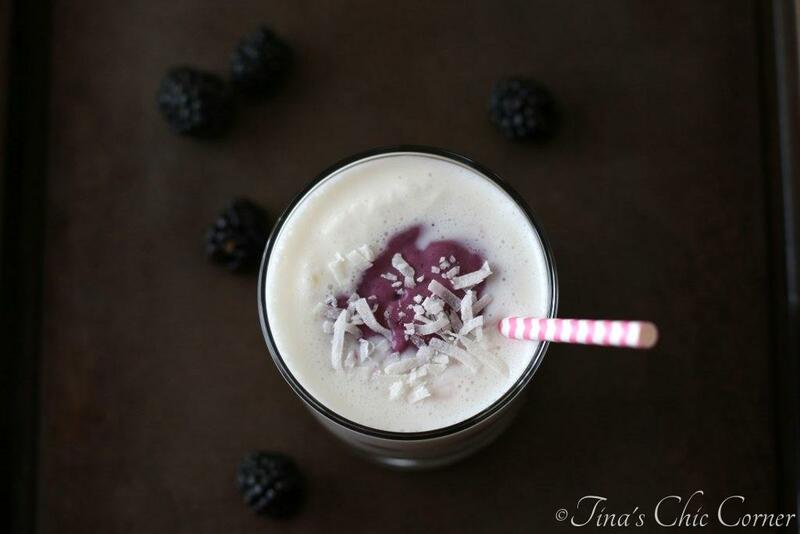 There can never be too many smoothie recipes in my book Tina – so keep them coming! I love the way you separated the two flavors – super cute. And BTW, I am a huge Home Goods fan, and I would’ve bought those glasses if I’d seen them! They are adorable. I love the layered in smoothies!! It’s always just so darn pretty! And strawberry and mango is a fantastic combo! 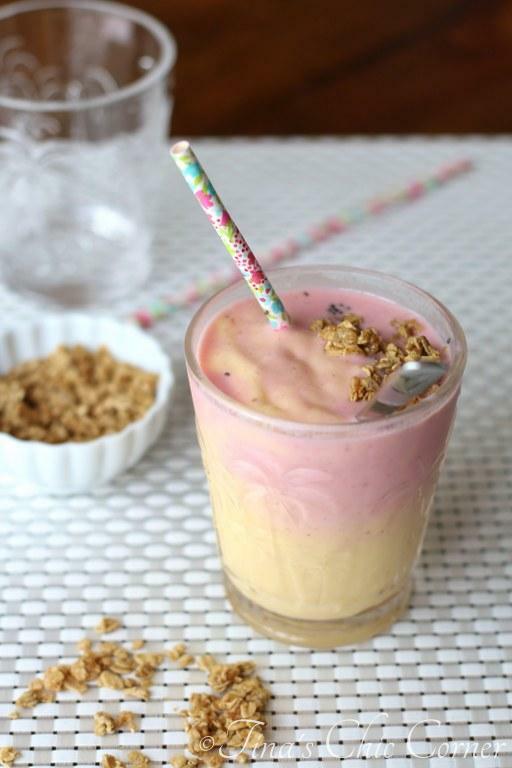 I do them together all the time in my smoothies but never with yogurt – need to try that next time! 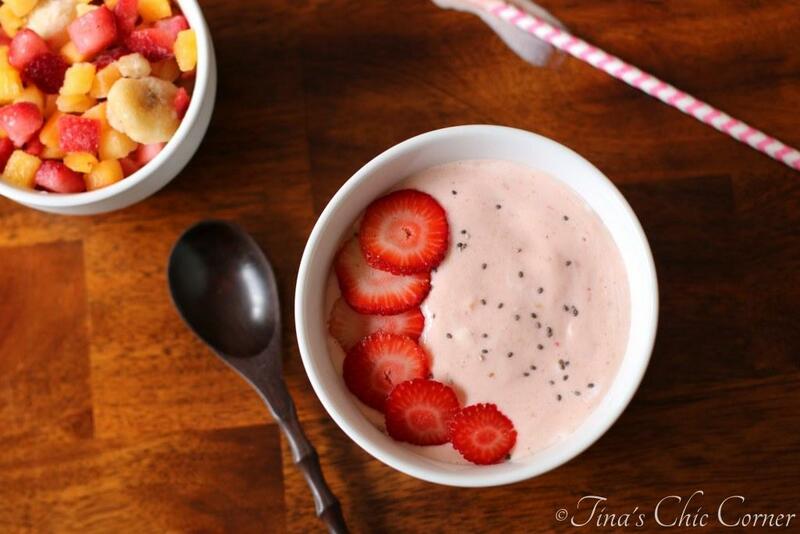 Strawberries and mangos are two of my favorite fruits! Love that you let each color sit on its own in the glass, super cute!